Insight is a salon & spa management software that helps small, mid-size and enterprise organizations in managing appointments, clients and staff. The software can be installed on-premises or hosted in the cloud. 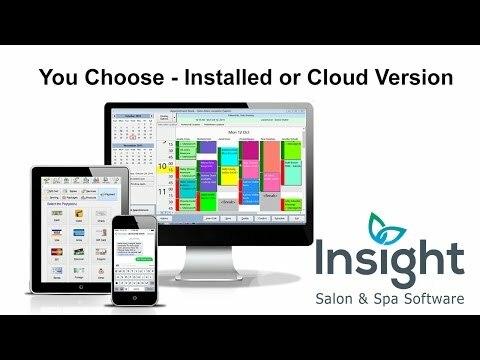 Insight salon & spa software offers a variety of features such as appointment management, client & staff management, marketing services and reporting. Users can book appointments and reserve service rooms and resources online, and receive appointment confirmation messages on their phones. The tool records client preferences, formulas and other notes as well as tracking product, service and appointment histories and other personal details such as birthdays and anniversaries. The software also stores contact and employment details of staff, sets up flexible, rotating work schedules, and supports role-based access to data using passwords and administrative controls. Users can generate over 80 report types including sales and appointment trends, inventory and services. Multiple payment methods can be accepted for a single invoice, and discounts and cancellations tracked, with hardware integrations for barcode scanners, cash drawers and receipt printers. Insight’s inventory management feature helps to analyze inventory levels and track partial use of an item. The pricing grid feature lets clients optimize sales revenue and price services based on department, category, and employee skills or experience. Insight software can be customized to meet specific customer requests and offers add-ons and integration with third-party software such as QuickBooks to help salons and spas improve their efficiency and client experience. We took over ownership of a salon that has used Insight for years, so we decided to keep using it. Overall it functions well and has pretty much all of the features we need. Throughout the last year we ran into a few technical hiccups but customer service was helpful in getting things ironed out. We have an excellent representative that is okay with us emailing her directly which is a rare thing and is much appreciated. Most of the support staff is helpful but there's one person that seems to get annoyed or sound inconvenienced when I call in about something. It's happened a handful of times with that support staff member. If you're a relatively small salon & spa, Insight is a great choice. We have found that the monthly fee added on top of the price to purchase SMS bundles has caused the cost of Insight to exceed other software on the market. If you send a lot of text messages to clients, keep this mind since it can increase your budgeted expense for software. Overall quality (4) - It works well but at times throws error messages for certain reports that requires a call to support staff. Ease of Use (4) - There's a learning curve to Insight but that's nothing new. There's a TON of reports which takes considerable time to learn, and no one report includes a dashboard of all statistics an owner might need. I find this tedious having to run several reports multiple times for each team member. I can recommend Insight to anyone looking for a salon & spa software, but felt it's my duty to cover both the pros and cons. Hopefully this review will help.Offers several features that most owners need. Relatively easy to learn and support staff seems willing to help if you're lost or have issues with anything. Uptime is good if you're using the cloud version, which is recommended over the installed version. Offers several features that most owners need. Relatively easy to learn and support staff seems willing to help if you're lost or have issues with anything. Uptime is good if you're using the cloud version, which is recommended over the installed version. Having to buy SMS bundles drives up the cost of the software. Budget wisely. Random errors when running some reports, which are usually fixed once support knows about it. As we have told many of our users, if you have an idea for a specific report that you would like to see added to Insight, please send us a rough outline of your specifications to requests@salon-software.com and we will try to add it in to a future release. Asking for a "dashboard with all stats an owner might need" is fairly subjective because each owner might have different thoughts on what those "needs" are so if you can give us a specific example of what you want to see we can work on that. Insight Makes My Life Easier! PROS: Ease of use, Great Technical Support, Very Affordable CONS: This isn't necessarily a con, because the program's functionality is effective, but it would be nice to have a greater range of options in some areas of the program Our salon and spa has been using Insight for a number of years. Insight Salon Software is so easy to use. Steps are intuitive. Even if you didn't have someone available to show you how to use the program, you could learn the system fairly quickly on your own. The price point is reasonable, and there have been no hidden costs or fees. About a year ago another software was highly recommended to us, and we opted to give it a try. And try we did; we struggled to learn and use the system. 6 months later, we took the loss on the other software and came back to Insight. The support I received to transition back made it so quick and painless that I almost couldn't believe it. And when I announced to my staff that morning that we were back live with Insight, every member either hugged or thanked me profusely! Now, we could get back to focusing on important things, not on a software program!! One thing I love about Insight is the ease of movement within the program. For instance, when you open a search screen, your cursor automatically appears in the search box and in many places you can simply hit Enter to move to the next box. These may seem like minor details, but if you've ever worked with this capability and then tried to use another program that doesn't have it, the time saving aspect becomes quickly apparent. We do at times have issues with the automatic features working correctly - appointment confirmations, nightly backups, phone app - and end up having to these things manually. But it is also a problem we had with the other program. These types of issues are just part of it. When something goes wrong, though, the technical team is always available and always friendly and helpful. We work off a fairly detailed business plan, and I wish there were more detailed options available for some areas - such as special commissions on specific services, report sorting, etc. - that would be more in line with some of the particulars of the way we operate. I hope to be able to work with Insight on some of these things. Bottom line, Insight Salon Software is more than worth the investment. Customer support. They are friendly and very helpful and are always there when we need them!!! 24/7!! There are so many features. There really should be a class to talke for about a week to learn everything. I've had it for almost three years still am not using everything because I'm don't know how it works. I also think it's crazy we have to pay extra for text messaging. I was also told when ai bought the system it would become apple friendly which was why I chose it. Now I am told that will never happen because of the platform it was built in. Basically your sales department lied to be to get the sale. Hi Roberta, we appreciate your feedback. While Insight runs best with Windows, it certainly can work with Macs as well. As we offer true, two-way text messaging (not simply email-to-text), there is a cost for sending SMS. Depending on the number of texts you wish to send, our Insight Deluxe Cloud plan may be a more affordable option. Talk to our Sales Team (1-888-919-5841) to learn more. Can't personalize the system, not really user friendly for hair salon with chair renters that have individual prices and services offered. On line booking system should have a notification tab to advise of a cancellation just as it does for an online appointment booked. Suzanne, I believe that most if not all of your concerns can be taken care of in the software already. Your best bet is to call customer service at 1-800-805-4532 and ask about the best way to handle these things and they can work with you to personalize your copy to work the way you want with your renters and the online booking and cancellations. •	Insight salon & spa software offers a variety of features such as online appointment booking, customer management, employee management and inventory tracking to help customers run their businesses efficiently. •	The software stores client information such as appointment history, products & services consumed and other personal details and sends targeted email campaigns & text messages to build effective customer relationships. •	The tool also helps in payroll management of employees and tracks employee hours, payroll types and calculates taxes & other deductions automatically. •	Insight provides a variety of advanced add-ons that help in credit card processing, remote access, text message marketing and membership management to improve client experience and operational efficiency. •	The software can be installed on-premises or be hosted in the cloud, and also provides native mobile applications for Android and iOS devices. Below are some frequently asked questions for Insight Salon Software. Q. What type of pricing plans does Insight Salon Software offer? Q. Who are the typical users of Insight Salon Software? Q. What languages does Insight Salon Software support? Q. Does Insight Salon Software support mobile devices? Q. Does Insight Salon Software offer an API? Yes, Insight Salon Software has an API available for use. Q. What other apps does Insight Salon Software integrate with? Q. What level of support does Insight Salon Software offer? Q. Which apps is Insight Salon Software compared to most often?